Pantomime season arrived three months early in Westminster and Fleet Street yesterday with the latest revelations on the Skripal saga. Like an aging and fading Hollywood Diva, Theresa May orchestrated a day of press announcements intended to make us all believe that there is a Red under the bed and that the Russians eat their babies. This was also meant to illustrate to us all that she was firmly in change. Despite the fact that her cabinet is split, her party hate her and poll after poll states that the UK population don't trust her on Brexit. It would have been funny if it wasn't so damn serious. Our MSM lapped this up like applauding seals at SeaWorld, desperate for the keeper to throw them another fish for performing their duties. Kay Burley and Sky news even went to Salisbury to "report" even though if we believe the Government narrative the story has firmly moved back to Moscow! Today they are doing a series of specials from the town, that's Salisbury not Moscow! On the surface the evidence is compelling. We have lots of CCTV camera shots and stills, the men flew in and out of Moscow, the deadly novichok was brought in to the UK in a sealed perfume box, the men went on a recce to Salisbury the day before, they left traces of the nerve gas in their hotel room etc, etc. The MSM journos loved all of this but did any one of them stop to question the latest twist in the Government narrative? No of course not! So, let's go through it shall we, step by step for the hard of questioning i.e. British journalists. I have seen enough James Bond movies and spy thrillers to know that highly trained State Operatives would not come in and out of the "rogue" nation by a direct route. They would surely enter via and exit via another country to cover their tracks? If as we are told these two were State controlled would they travel together and bring the nerve gas with them?! In the best spy movies, the "evil Russians" always meet on a Park bench and talk about the lovely weather for the time of year and then one walks off leaving a case with the nerve gas in it, don't they? Would highly trained GRU operatives make sure their faces were clear for all to see on every CCTV camera they passed. I couldn't see their feet but they were wearing clown shoes? This was certainly no James Bond movie, not even Austin Powers, no this is a plot that even Danger Mouse and Penfold would reject. If these are State controlled, as she claims, what are their names and why do our spooks only have their aliases? Why have we not taken up the offer from Russia of help? We should be asking them to find out who these two men really are, as surely Putin would love to nail them as he is taking the blame for this despicable act of terror on UK soil. However, instead of asking for help Theresa May is straight on the offensive knowing full well that there is no extradition treaty between our Countries so these men will never be put on trial. We also need to know just how long have the authorities known that the spies stayed at that hotel in London and why haven't the public been warned if there was novichok in the room. Has the room been closed off or used since they made this discovery? If the gas is so deadly was the Hotel owner advised by Porton Down and Public Health England just to wash the sheets and use baby wipes to wipe surfaces just like the population of Salisbury were? Whilst of course Police cars are now being buried and burnt? Did the cops not have any wet wipes to hand to clean their Pandas? If they sprayed the gas as described how come neither of the spies died or were affected, I thought Kay Burley told us that it was deadly? Did they wear rubber gloves when they sprayed the Novichok on the door handle? If so where did they dispose of the gloves or the masks that they surely wore too. Also, why have none of the coppers who stood outside the Skripal front door for weeks on end not died or fallen ill? Druggie Charlie Rowley told the papers and TV crews that he found the perfume bottle in a sealed case. So, did the highly trained Russian Operatives gift wrap the poison bottle again as they walked back from putting it on the door handle? We are told constantly that the tragic woman who died said the perfume was oily to the touch, would Sergei not have noticed this when he shut the door, or even Yulia and are we really meant to believe that they both pulled the door shut? 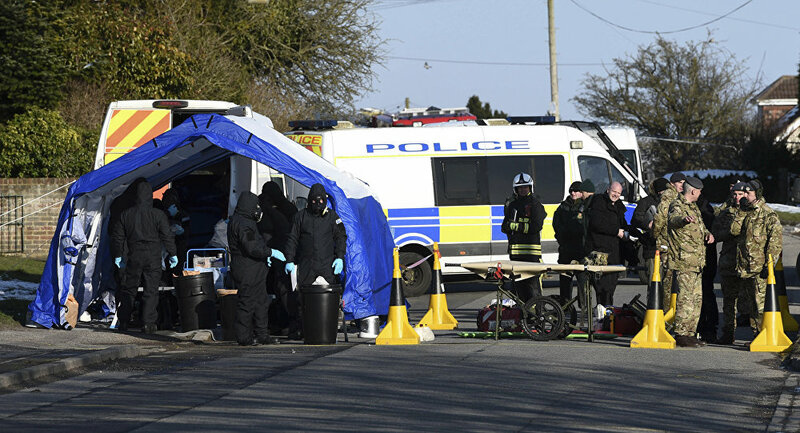 Finally, why would highly skilled Russian agents dump the novichok in Salisbury? I am sure by now you must agree that if they are really highly trained Russian Spies I would suggest the first thing Mr Putin should do is sack their trainers! Craig Murray has also made the point that the date and time stamp of the two photos of the two men arriving at Gatwick is exactly the same and pointed out that this defies the laws of physics! The Met responded by saying that they were walking down identical but separate corridors, which is true and of course possible, but are we really meant to believe that they were in perfect timed synchronicity? It is also hard to argue with George Galloway when he says the question still remains, why would Russia a week before the Presidential elections and 100 days before the World Cup in Moscow carry out an attack like this? Talking of timing it is interesting to note that all this happened yesterday as MP's returned to the Commons and the Tories are more divided than ever over Brexit. It is also important to note that it looks highly likely that the Brits and the USA are about to re-enter the conflict in Syria. That's an odd coincidence is it not?! Now our Prime Minister is busy sabre rattling and threatening to take on all comers, well just Russia actually, and she is going to launch a cyber war against Putin. She said that this nerve gas attack was a threat to "all our allies and to all our citizens" and promised to do "whatever is necessary to keep our people safe". This woman is deluded quite deluded. The British people do not want any kind of war with Russia, it wants a trade deal and it wants out of the EU something that she has failed to give them in over two years. MSM journalists need to stop catching fish and start asking questions, serious questions of our Politicians before we are trapped in another war that we cannot possibly win.